Nanotechnology, 30 (8), pp. 085503, 2019. 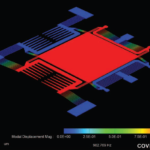 Atomic force microscope (AFM) cantilevers with integrated actuation and sensing provide several distinct advantages over conventional cantilever instrumentation. These include clean frequency responses, the possibility of down-scaling and parallelization to cantilever arrays as well as the absence of optical interference. While cantilever microfabrication technology has continuously advanced over the years, the overall design has remained largely unchanged; a passive rectangular shaped cantilever design has been adopted as the industry wide standard. 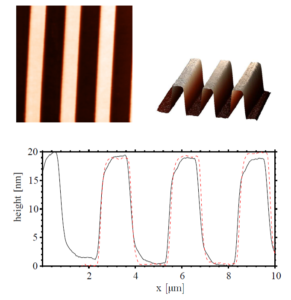 In this article, we demonstrate multimode AFM imaging on higher eigenmodes as well as bimodal AFM imaging with cantilevers using fully integrated piezoelectric actuation and sensing. The cantilever design maximizes the higher eigenmode deflection sensitivity by optimizing the transducer layout according to the strain mode shape. Without the need for feedthrough cancellation, the read-out method achieves close to zero actuator/sensor feedthrough and the sensitivity is sufficient to resolve the cantilever Brownian motion. IEEE/ASME Advanced Intelligent Mechatronics (AIM), Auckland, New Zealand, 2018.
steps, and a high amount of feedthrough from actuation to sensing electrodes. This work proposes two hybrid cantilever designs with piezoelectric actuators and piezoresistive sensors to reduce the actuator to sensor feedthrough. The designs can be realized using a commercial microelectromechanical systems fabrication process and only require a simple five-mask patterning and etching process. Finite element analysis results are presented to obtain modal responses, actuator gain and sensor sensitivities of the cantilever designs. International Conference on Manipulation, Automation and Robotics at Small Scales (MARSS), 2018. 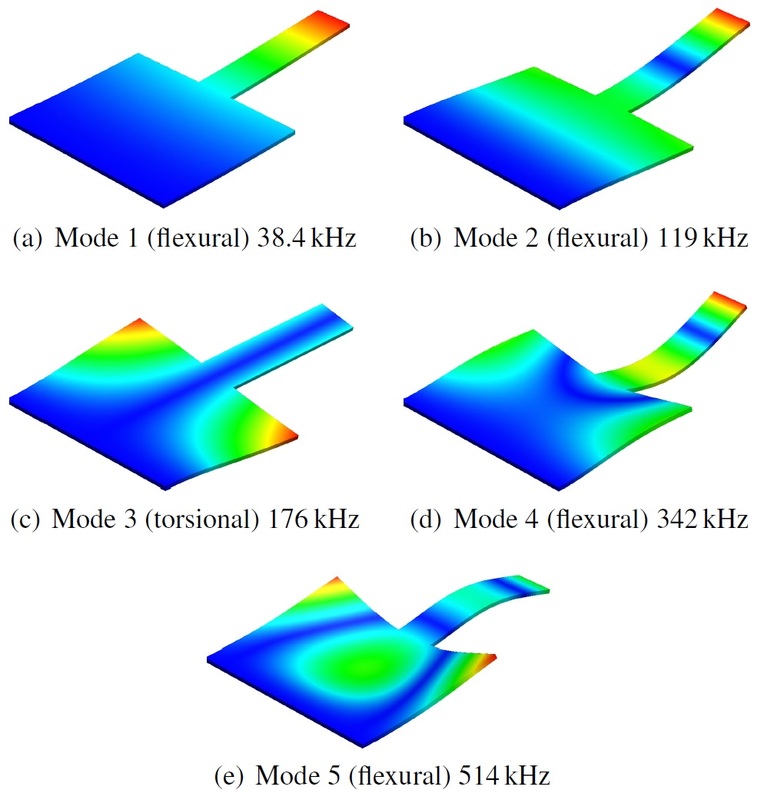 This article presents a novel cantilever design approach to place higher mode frequencies within a specific frequency band to alleviate instrumentation and Q control feasibility. This work is motivated by the emerging field of multifrequency atomic force microscopy (AFM) which involves the excitation and/or detection of several cantilever modes at once. Unlike other operating modes, multifrequency AFM allows the tracking of the sample topography on the fundamental mode while simultaneously acquiring complimentary nanomechanical information on a higher mode. However, higher modes of conventional rectangular tapping-mode cantilevers are usually in the MHz regime and therefore impose severe restrictions on the direct controllability of these modes. To overcome this limitation, an optimization technique is employed which is capable of placing the first five modes within a 200 kHz bandwidth. Journal & Proceedings of the Royal Society of New South Wales, 151 (1), pp. 111, 2018, ISSN: 0035-9173/18/010111-01. tion channels. The ability to control these modes and their fast responses to excitation is believed to be the key to unravelling the true potential of these ethods. This work addresses three major drawbacks of the standard AFM setup, which limit the feasibility of multi-frequency approaches. 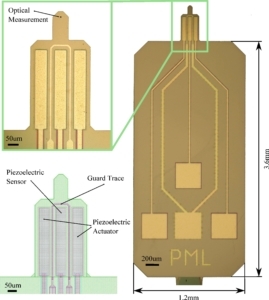 First, microelectromechanical system (MEMS) probes with integrated piezoelectric layers is motivated, enabling the development of novel multimode self-sensing and self-actuating techniques. Specifically, these piezoelectric transduction schemes permit the miniaturization of the entire AFM towards a cost-effective single-chip device with nanoscale precision in a much smaller form factor than that of conventional macroscale instruments. Second, the integrated actuation enables the development of multimode controllers which exhibits remarkable performance in arbitrarily modifying the quality factor of multiple eigenmodes and comes with inherent stability robustness. The experimental results demonstrate improved imaging stability, higher scan speeds and adjustable contrast when mapping nano-mechanical properties of soft samples. 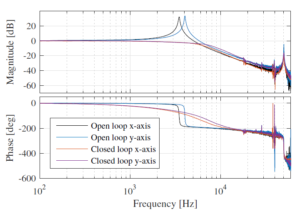 Last, in light of the demand for constantly increasing imaging speeds while providing multi-frequency flexibility, the estimation of multiple components of the high-frequency deflection signal is performed with a linear time-varying multi-frequency Kalman filter. The chosen representation allows for an efficient high-bandwidth implementation on a Field Programmable Gate Array. Tracking bandwidth, noise performance and trimodal AFM imaging on a two-component polymer sample are verified and shown to be superior to that of the commonly used lock-in amplifier. 7th Multifrequency AFM Conference, Madrid, Spain, 2018. Atomic force microscopy (AFM) cantilevers with integrated actuation and sensing on the chip level provide several distinct advantages over conventional cantilever instrumentation. These include clean frequency responses, the possibility of down-scaling and parallelization to cantilever arrays as well as the absence of optical interferences. While cantilever microfabrication technology has continuously advanced over the years, the overall design has remained largely unchanged; a passive rectangular shaped cantilever design has been adopted as the industry wide standard. 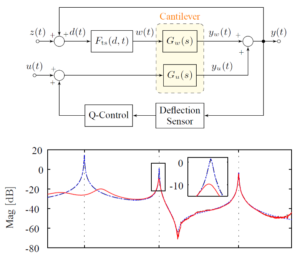 Consequently, conventional cantilever instrumentation requires external piezo acoustic excitation as well as an external optical deflection sensor. Both of these components are not optimal for current trends in multifrequency AFM technology which revolve around further down-sizing, parallelization and measurements at multiple higher eigenmodes. 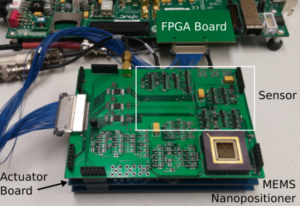 Using microelectromechanical systems (MEMS) fabrication processes, this work aims to optimize cantilever instrumentation by realizing a new class of probes with high-performance integrated actuators and sensors. Equipped with multiple integrated piezoelectric layers for both actuation and sensing, these cantilevers are capable of achieving an increased higher eigenmode sensitivity and/or guaranteed collocated system properties compared to commercially available counterparts; examples of such designs are shown in Figure 1. The geometry as well as the integrated actuator/sensor arrangement is optimized using finite element modelling with individual design goals. The designs are realized using a commercial MEMS fabrication process and only require a simple five-mask patterning and etching process and post-fabricated sharp tips. Review of Scientific Instruments, 88 (086109), 2017.
up to four orders of magnitude without sacrificing robust stability. 20th IFAC World Congress, pp. 15554-15560, 2017.
well beyond the open-loop fundamental resonance, with a tracking error of only 4.6nm. Micro & Nano Letters, 12 (5), pp. 315-320, 2017.
lower-order modes are more accurately placed than higher-order modes. With two fabricated designs, the error in the second mode is at most 2.26% while the greatest error in the fifth mode is at 10.5%. International Conference on Mechatronics, Gippsland, Australia, 2017. This work outlines the instrumentation and actuation of a MEMS nanopositioner, implementing a switching electronics based self-sensing actuation technique. 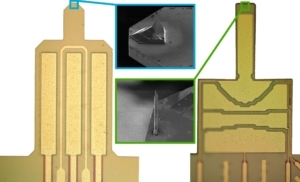 Self-sensing actuation allows for optimal use of transducer die space in MEMS designs. The switching design accommodates actuation voltages of 50V and is compatible with the silicon-on-insulator microfabrication process. The switching electronics are designed to be directly interfaced to a digital control platform. The actuator is based on the class D amplifier and the sensor is implemented using a modulator to create a displacement-to-digital type sensor that is operated at 1MHz. IEEE Journal of Microelectromechanical Systems, 26 (1), pp. 215-225, 2017. The atomic force microscope (AFM) is an invaluable scientific tool; however, its conventional implementation as a relatively costly macroscale system is a barrier to its more widespread use. A microelectromechanical systems (MEMS) approach to AFM design has the potential to significantly reduce the cost and complexity of the AFM, expanding its utility beyond current applications. 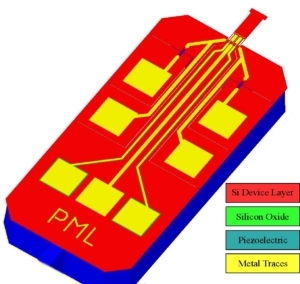 This paper presents an on-chip AFM based on a silicon-on-insulator MEMS fabrication process. The device features integrated xy electrostatic actuators and electrothermal sensors as well as an AlN piezoelectric layer for out-of-plane actuation and integrated deflection sensing of a microcantilever. 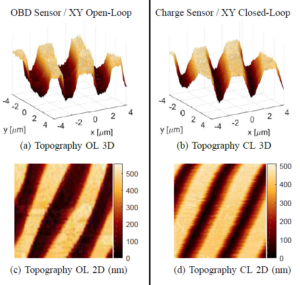 The three-degree-of-freedom design allows the probe scanner to obtain topographic tapping-mode AFM images with an imaging range of up to 8μm x 8μm in closed loop. IEEE Transactions on Control Systems Technology, 24 (4), pp. 1149-1159, 2016. Numerous dynamic Atomic Force Microscopy (AFM) methods have appeared in recent years, which make use of the excitation and detection of higher order eigenmodes of the microcantilever. The ability to control these modes and their responses to excitation is believed to be the key to unraveling the true potential of these methods. In this work, we highlight a multi-mode Q control method that exhibits remarkable damping performance and stability robustness. The experimental results obtained in ambient conditions demonstrate improved imaging stability by damping non-driven resonant modes when scanning is performed at a higher eigenmode of the cantilever. Higher scan speeds are shown to result from a decrease in transient response time. Beilstein Journal of Nanotechnology, 7 , pp. 284-295, 2016. 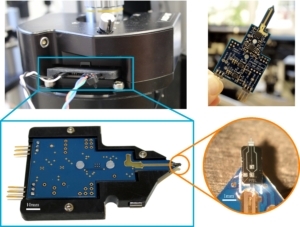 Using standard microelectromechanical system (MEMS) processes to coat a microcantilever with a piezoelectric layer results in a versatile transducer with inherent self-sensing capabilities. 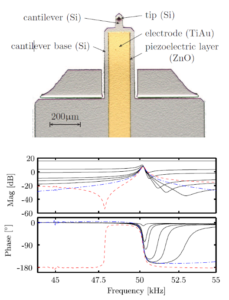 For applications in multifrequency atomic force microscopy (MF-AFM), we illustrate that a single piezoelectric layer can be simultaneously used for multimode excitation and detection of the cantilever deflection. 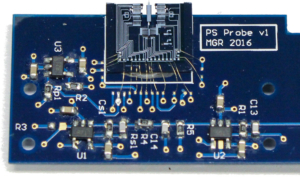 This is achieved by a charge sensor with a bandwidth of 10 MHz and dual feedthrough cancellation to recover the resonant modes that are heavily buried in feedthrough originating from the piezoelectric capacitance. The setup enables the omission of the commonly used piezoelectric stack actuator and optical beam deflection sensor, alleviating limitations due to distorted frequency responses and instrumentation cost, respectively. The proposed method benefits from a more than two orders of magnitude increase in deflection to strain sensitivity on the fifth eigenmode leading to a remarkable signal-to-noise ratio. Experimental results using bimodal AFM imaging on a two component polymer sample validate that the self-sensing scheme can therefore be used to provide both the feedback signal, for topography imaging on the fundamental mode, and phase imaging on the higher eigenmode. 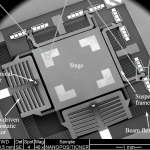 A 2 degree of freedom microelectromechanical system (MEMS) nanopositioner is presented in this paper. The nanopositioner is fabricated using a standard silicon-on-insulator process. The device demonstrates a bidirectional displacement in two orthogonal directions. As the displacement sensing mechanism, bulk piezoresistivity of tilted clamped-guided beams is exploited. The characterization reveals more than 15 μm displacement range and an in-plane bandwidth of above 3.6 kHz in both axes. The piezoresistive sensors provide a bandwidth which is more than ten times larger than the stage's resonant frequency. To evaluate the sensor performance in closed-loop, an integral resonant controller together with an integral tracking controller are implemented where piezoresistive sensor outputs are used as measurement. 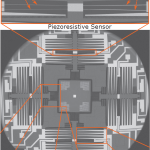 The controlled nanopositioner is used for imaging in an atomic force microscope. ASME International Design Engineering Technical Conferences & Computers and Information in Engineering Conference, pp. V004T09A009, Boston, Massachusetts, USA, 2015. Various Atomic Force Microscopy (AFM) modes have emerged which rely on the excitation and detection of multiple eigenmodes of the microcantilever. The conventional control loops employed in multifrequency AFM (MF-AFM) such as bimodal imaging where the fundamental mode is used to map the topography and a higher eigenmode is used to map sample material properties only focus on maintaining low bandwidth signals such as amplitude and/ or frequency shift. However, the ability to perform additional high bandwidth control of the quality (Q) factor of the participating modes is believed to be imperative to unfolding the full potential of these methods. This can be achieved by employing a multi-mode Q control approach utilizing positive position feedback. The controller exhibits remarkable performance in arbitrarily modifying the Q factor of multiple eigenmodes as well as guaranteed stability properties when used on flexible structures with collocated actuators and sensors. 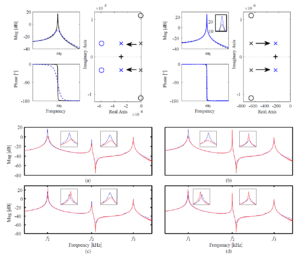 A controller design method based on pole placement optimization is proposed for setting an arbitrary on-resonance Q factor of the participating eigenmodes. Experimental results using bimodal AFM imaging on a two component polymer sample are presented. American Control Conference, Chicago, USA, pp. 3473-3477, 2015. 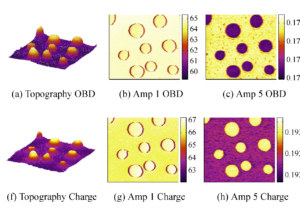 19th IFAC World Congress, Cape Town, South Africa, 2014.
force microscopy (TM-AFM) utilizing charge measurement and charge actuation, respectively. 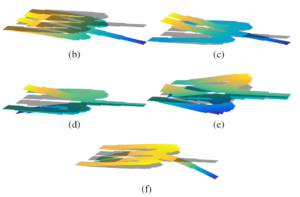 Journal of Microelectromechanical Systems, 23 (3), pp. 610-619, 2014.
Review of Scientific Instruments, 84 (12), pp. 125006, 2013. This work proposes a novel self-sensing tapping-mode atomic force microscopy operation utilizing charge measurement. A microcantilever coated with a single piezoelectric layer is simultaneously used for actuation and deflection sensing. The cantilever can be batch fabricated with existing Micro Electro Mechanical System processes. The setup enables the omission of the optical beam deflection technique which is commonly used to measure the cantilever oscillation amplitude. Due to the high amount of capacitive feedthrough in the measured charge signal, a feedforward control technique is employed to increase the dynamic range from less than 1dB to approximately 35dB. Experiments show that the conditioned charge signal achieves excellent signal-to-noise ratio and can therefore be used as a feedback signal for AFM imaging. IEEE/ASME International Conference on Advanced Intelligent Mechatronics, pp. 77-82, Wollongong, Australia, 2013. When operating the Atomic Force Microscope in tapping mode it is possible to decrease the quality factor of the microcantilever to enhance scan speed. %Standard Q Control techniques involve velocity feedback with the disadvantage of additional sensor equipment, or time-delay position feedback which may lead to instabilities of out-of-bandwidth modes.Various resonance controllers have been proposed which do not rely on expensive velocity sensors and guarantee stability of the closed loop system even in the presence of unmodeled dynamics. A new field of Atomic Force Microscopy is evolving, which makes use of multiple frequency excitation and detection of the cantilever modes making it necessary to be able to control these modes and their response to excitation. This work proposes a multi-mode Q control approach utilizing positive position feedback, offering full control over the first two flexural modes of the cantilever. By completely damping the first mode and adjusting the quality factor of the second mode, it is possible to scan and obtain images at the second resonance frequency which improves image quality at high scan speeds due to the increased bandwidth of the z-axis feedback loop. Proc. IFAC Symposium on Mehatronic Systems, Hangzhou, China, pp. 375-382, 2013.